Are you using modern technology when you travel to discover and explore the world? Download FREE maps for any location in the world. Carry the Garmin for walking or driving touring so you always know where you are and how to get to your destination! As you travel, tap on the “Where am I” button and save locations for the ship's dock, the meeting point for your tour bus, or special places you want to stop on the way back to your ship. Always know where you are, your destination, the route, and travel time. ​Stay in touch - never leave home without it!!! Unlimited worldwide GPS maps = FREE. Note: This is REAL GPS technology. These devices have a built-in GPS antenna to communicate with satellites from any place on planet earth. It's rare to find a smart phone with a built-in GPS antenna. Cell phones “simulate” GPS using WiFi and cell towers to triangulate your position. It works for mapping as long as you are in an area where cell phone and WiFi service are good and you have a contract for the service. When you travel the world, you'll visit locations where cell service and WiFi are marginal or not available. Your smart phone cannot map your location in these areas. The best mobile map devices use “REAL GPS” for accurate positioning, and GPS is FREE. 2 Choose a pre-defined country. I clicked on “Spain” which is listed under “Europe"
I could have downloaded the map for Spain but I wanted to add maps near Livorno Port in Italy. 3 Design a custom map Perhaps you'd like to add some additional tiles? ​I clicked to enable manual tile selection. I clicked on tiles for La Spezia, Lucca, Livorno, Firenze, etc. near the Livorno, Italy port. See the map at left. When you design a custom map, enter your email address and click “Build my map” at 4. You'll receive two emails. The first states the map is being built and has a link to check status. The second email has the link to download your map. The email has four links to download different map formats. Use the link listed as option D below. A) osm_generic_windows.exe 383M Map installer for BaseCamp / MapSource on the Windows platform. B) osm_generic_tiles.zip 382M Compressed file containing the tiles and overview map. This is useful for applications like Qlandkarte and Linux users. C) osm_generic_macosx.zip 375M Map installer for BaseCamp / Mac OSX platform. It took 22 minutes to download the map zip file to my computer. The icon with a zipper shows it is a zip file. ​When the file is "unzipped" it becomes a Disk Image File. The map file MUST be in the Disc Image File format to use with your Garmin GPS. ​Insert an 8GB Micro-SD card in your computer, create a file folder on the SD card called "garmin" and copy the Disc Image file called gmapsupp to the garmin folder. Insert the card, and turn on your GPS. These instructions are for a Garmin Nuvi 2460. Other Garmins are similar. 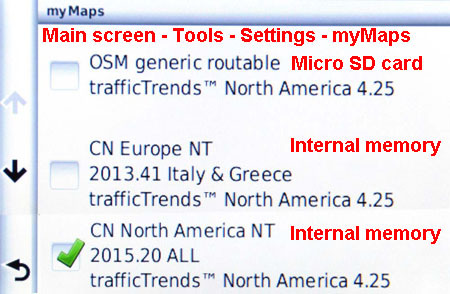 I added the red text to show my GPS has two maps in internal memory from the Garmin website and one OSM generic routable map on the Micro-SD card. The name for the OSM map of “trafficTrends North America 4.25” is meaningless. I've inserted five different SD cards with maps from Europe and my Garmin describes the maps as North America. You can't change the name of the map on the SD card. ​NOTE: Garmin only “sees” active maps. Make the maps active by tapping on the box next to the map name. You can make one or all maps active. See my Map User Guide http://www.tomsportguides.com/map-user-guide.html for information on how to obtain GPS coordinates from Google or Bing maps for places you will visit on shore excursions. Also, my port guides are a good source of GPS coordinates for the port area. 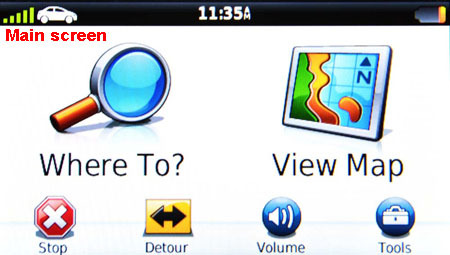 From the Garmin main screen, tap Where To? There are many choices to enter data. The first screen at left below is the “top” of the choices screen. Tap on the down-pointing arrow to see more options for finding locations. 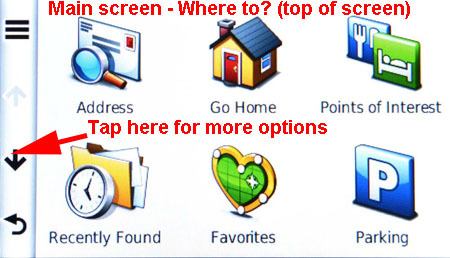 To enter GPS coordinates, click on the globe on the bottom right of the second screen. If you need to change the format, tap on the 3-line menu bar at the top left of the screen. This will open a screen (below left) that allows you to select a different format for data input. The screen below right appears. 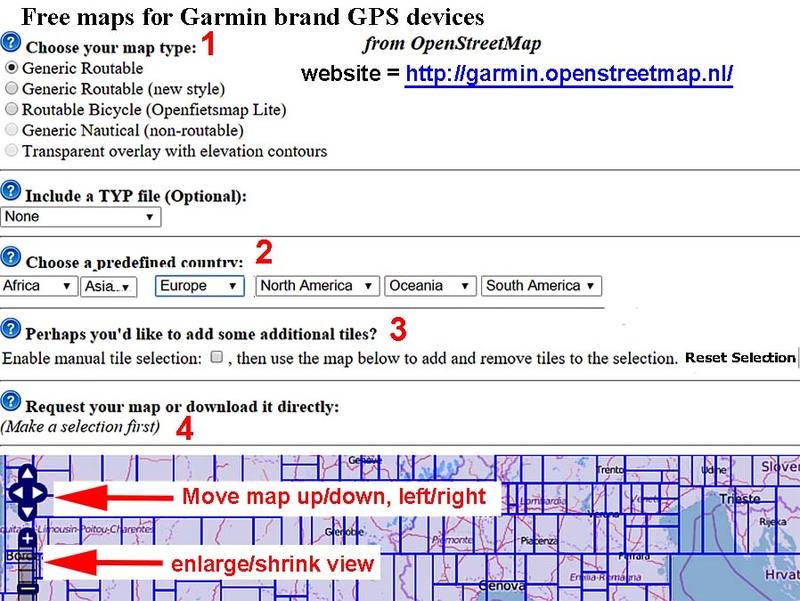 Garmin accepts GPS coordinates in three formats. Tap on the format you plan to use and tap on Save. Google maps output GPS as Decimal Degrees and Degree Minutes Seconds. I use both of these GPS formats in my port guides. My Livorno Port Guide lists N 43° 46' 7.62", E 11° 15' 20.39" GPS coordinates for the Uffizi museum in Florence. You will see the map location for those coordinates. At the top left corner of the map, tap on the 3-line menu bar and then tap on “Save”. ​Type a name for that tourist site and tap on “Done”. That location will be saved to “Favorites”. Before I leave for vacation, I program my Garmin with dozens of places I plan to visit. If I am renting a car, I create “favorites” for my entire driving route and all the stops I plan to visit. This makes it easy to explore a large area without ever getting lost and I always know the time it will take to get back to the rental agency. 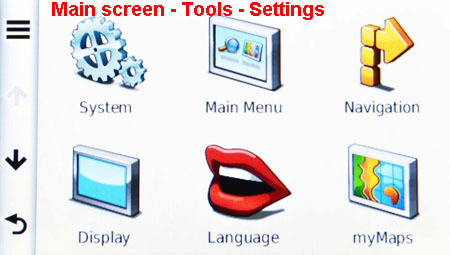 From the main screen, click on Tools. 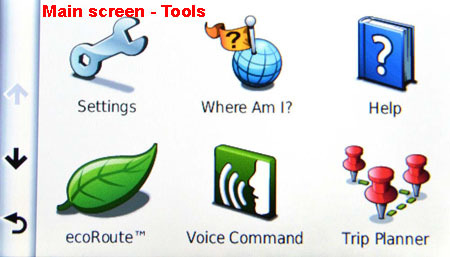 One of the choices on the tools screen is Where am I ? When you tap on “Where am I ?”, the screen at left appears. It shows your location. Tap on Save, enter a name, then tap on Done. That location is saved to your “Favorites”. If you rent a car, save that location and call it “Car Rental”. At any time during my driving tour, I can set the destination to “car rental” to see the time it will take to get back. I use this to decide when I need to turn around and head back to the port. Once you have saved these locations, you can explore the tourist area and will always be able to plot a course to your way-points. Tap on the car icon at the Main screen top left corner. 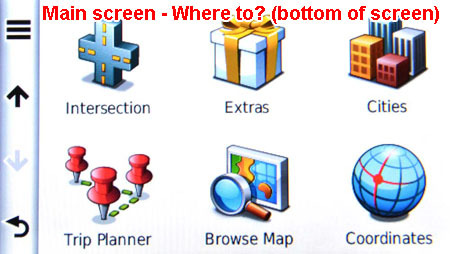 A screen will appear to choose Automobile or Pedestrian maps. Tap on your transportation mode and tap Save. GPS consumes a lot of battery power. If you are driving a car and have the GPS plugged into the cigarette lighter, it's not a problem. When using the Garmin on walking tours, you MUST conserve battery power. The two most important settings to conserve battery power are screen Brightness and sound Volume. From the Main screen, tap on “Tools”, tap on “Settings”, tap on “Display”, and slide the brightness to 10%. Tap on “Volume” on the bottom of the Main screen. Slide the volume control to 10%. Before making these adjustments, my battery life was 25 minutes. After reducing brightness and volume, my battery life increased to 120 minutes. Before you travel, test your Garmin by turning it on and setting it on your desk to determine the battery life and plan accordingly. Unless you need to view the screen turn the Garmin off when travelling to conserve battery life. I learned how to download free Open Street Maps to my Garmin GPS from my good friend and technology mentor, David Elgie. I asked David to write a description of the state of the art technology and devices he uses for mapping and communication while he travels the world. The following section of this web-page was written by David. Cell phones require reliable cell service for voice communication and/or WiFi for VOIP and text messaging. Unfortunately, there are many places where service is not reliable, or even available. GPS satellites can be accessed from any location on planet earth. As long as your mobile device has a built-in GPS antenna, can “see” the sky, and has battery power, it will accurately show your position on a map. Satellite service is free for your GPS map device. There is a fee to use GPS for communication. Voice communication via GPS requires a costly GPS phone and very expensive GPS phone service. GPS text communication is affordable. I use the Delrome InReach SE communicator ~ $ 225 at Amazon. The contract for unlimited, worldwide, two-way text messaging is $ 50/month. Other plans are 10 messages for $ 12/month, or 40 messages for $ 25/month. 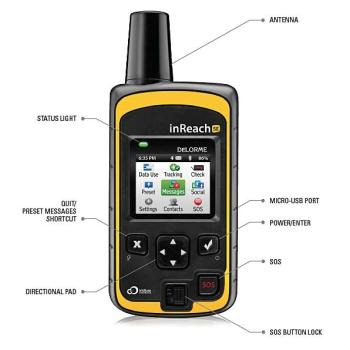 InReach SE allows me to send/receive 160-character text messages to/from any phone number or email address worldwide. The messages I send include my GPS coordinates so the recipient knows my exact location. I know my message has been sent because I get message confirmation. InReach SE can display text messages either on its small screen or on my Samsung tablet paired via bluetooth. I prefer to read messages and type them on my 10.1” tablet. Recently, I was on a cruise from Chile to Tahiti. Due to our remote location in the Pacific, the ship's internet service was not available for passengers in Tahiti. The ship's internet service sends signals to satellites that connect to land WiFi, then back to satellites, and the ship. Internet speed is like the old “dial-up” modems. Internet cost is high, the system is slow, and often, it's not available. When our ship could not access satellites for passenger internet in Tahiti, I went to the upper deck and exchanged text messages with my daughter in Canada. My InReach SE worked fine in this remote location. This technology for GPS text communication is amazing. I never leave home without it!. Cost = ~ $ 250 Size = 5.4"W x 3.3"H x 0.6"D with a 5”x3” screen weight = 192 gm. Micro-SD card size = 8GB. There can only be ONE OSM map on the SD card. My 7” Samsung tablet is lower cost, has a larger screen, and is thinner than Tom Sheridan's 5”x3” Garmin. My 10” Samsung has a large on-screen keyboard. I can also use bluetooth keyboards/mice for writing documents. Samsung tablets accept huge capacity Micro-SD cards and can store multiple OSM maps on each card. Tom's Garmin can only store one map per SD card. Tom agrees, he should have bought a Samsung. There are very few tablets/phones with “real” built-in GPS and slots for large capacity external storage, SD cards. Samsung appears to dominate this market. These Samsung tablets/phones are “perfect” for GPS mapping as your travel to explore the world. Where to buy tablets/phones with a built-in GPS antenna. Terminology is confusing. It's difficult to determine which tablets have a built-in GPS antenna. Electronics stores are not aware of built-in GPS. One store manager told me, “There are no Samsung tablets with built-in GPS.” Also, the list of specifications on Amazon does not show whether it has a built-in GPS antenna. Samsung uses the term “A-GPS, GLONASS” for models with a built-in GPS antenna. Under the “Connectivity” heading, look for a description of the GPS. Call the manufacturer to determine which tablet/phone models have a built-in GPS antenna to show map location without being connected to cell or WiFi service. When I hire a cab, I view the travel route on the map to ensure the driver is taking the correct route. And when I exit the cab, I know exactly which way to walk to my destination. It's comforting to always know where I am and the route to my destination. I used my tablet to show a cab driver our hotel location in Peru because my tablet and maps worked better than his cell phone maps. Real GPS technology always works and usually outperforms smart phones because cell service frequently has difficulty accurately triangulating your position when cell service is marginal. ​I used my tablet in Mexico to find our destination when my Garmin GPS car unit failed. These Samsung tablets are high quality, high reliability, high accuracy GPS devices. I am very pleased with the performance and capability of my Samsung GPS tablets with OSM maps. You can store files, maps, photos, etc. on internal memory and/or on a Micro-SD card. Purchase the appropriate size micro-SD card for your tablet. ​Open the Memory Card Slot cover. Important! Unmount the card before removing it. From the Home screen, touch Apps - Settings - Storage. Under SD card, tap Unmount SD card and then tap OK.
​Open the Memory Card Slot cover, gently press on the card so it pops out, and carefully remove it. 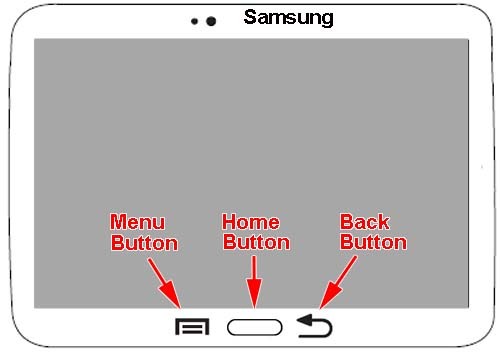 These instructions are based on my Samsung 7" Tab 2 and 10.1" Tab 3. The Tab 4 models use the same, latest OsmAnd app, so these instructions should work for them as well. The free version and tap install. This version allows the download of 10 maps. I recommend the $6.99 App version to download unlimited world maps and map updates. Tap the Menu Button on the tablet. When the menu appears, tap Settings. Scroll down to Personal. Slide the bar to the right so the bar is green. Location is turned on. A message will appear titled “Improve location accuracy? Let Google's location service apps find your location quickly and accurately to reduce battery consumption. Disagree or Agree. I did not want Google tracking me so I chose “Disagree". When you open OsmAnd+, the view will either be a split screen view or a full map view. If the opening screen is a full map view, you can switch to split screen by tapping on right side of the map or on the button in the bottom left corner of the screen. It's a box with 4 black boxes inside it. The split screen view is shown at right. Tap on the “gear” Settings Button at the top of the screen and select Configure Screen. A new screen appears. Tap to the right of Speed, GPS info, and Altitude. A green check box appears next to them. Exit back to the split screen and tap the settings button using the tablet's Back Button. My preference is to hold the tablet in landscape mode when using the map app except when adding favorites which works best in portrait mode. As you get comfortable with this app you can change more settings, but for now let’s just change a few basic settings. Tap General Settings, then tap unit of measure and set to your preference. Also adjust map orientation to “Don’t rotate north is up”. Where maps are stored: The default setting for map storage is internal memory. You can also store the maps on micro SD cards. Tap the “My Files” app. You will see Device Storage on internal memory. SD memory card will appear if there is a micro SD card installed. The screen above shows the Micro-SD card is recognized. ​Go to My Files again. Tap Manage Map Files. It's located underneath the “Configure Screen” on the settings menu. Tap All Downloads, scroll down to the area where you are now located. I assume home. ​Tap the area and more detailed locations will appear. Tap beside the province, state, country (varies depending on size of country) you wish to download. A check will appear in the box. Note: “1” appears as we are only downloading one map. ** Also note downloaded maps are in green framed boxes. 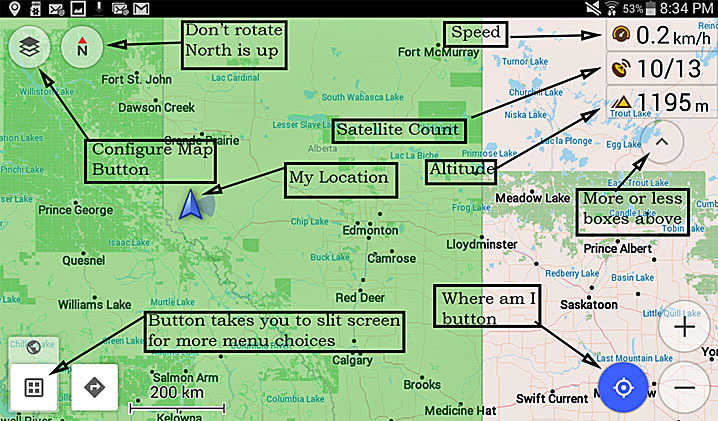 I downloaded Alberta but not Saskatchewan in the reference map in the image above, hence Sask. is white. Sask is there but it does not show all the detail until you download it. IMPORTANT: IF YOU CHANGE MAP STORAGE LOCATION, OSM WILL ONLY LOOK FOR MAPS IN THE NEW LOCATION. 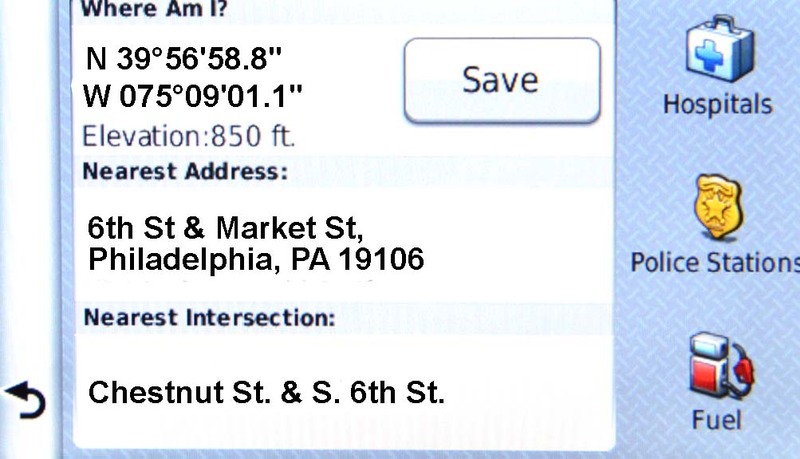 However if you are really tech savvy, cut and paste the maps from the old file location to the new location. I use this method to save a copy of favorite way-points and back them up on a separate hard drive. Open OsmAnd and tap the square button with 4 squares within it and then the settings button, tap general settings, tap Data Storage folder part way down the list, tap the pencil on the right side of the orange bar and tap external storage 2. In the image below I have already modified the storage. Yours should be similar once you have completed the steps. During this process the app may request copy which will copy maps from the internal memory. This copy command is actually a move command as maps will disappear in the internal memory and go to the SD card. Maps downloaded in the future will go to the SD card location. I also store my ship reading material and slide shows of previous trips on the 32 GB Micro-SD card. 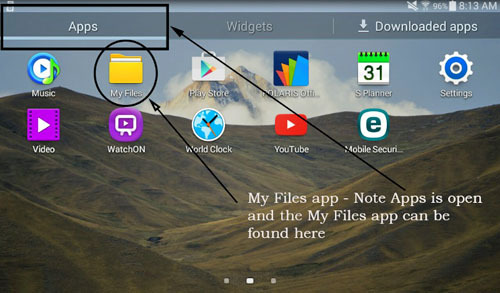 Tap the My Files app within the apps on your tablet if you installed an SD card. Tap SD memory card, tap Android, tap data, tap, net.osand.plus, tap files. You will see map files in this location. If you wish to delete maps: Within manage map files in OsmAnd (tap settings button to see manage map files) you will see the downloaded maps. Tap on the map file and you will see an option to delete (trash). However don’t delete World overview and world seamarks as they are generic for future trips. Exit this screen and go to the full map view screen. Tap the map side if a split screen comes up. Now you need to go outside with a clear view of the sky. Numbers will begin to appear in these boxes. See the image below. There is no magic set of #’s for the sat count but from my experience double digit counts usually work. In the top right corner of the screen you should see three boxes speed, satellite info, and altitude. If fewer than 3 boxes appear tap the V below the 1 or 2 box(s) and more should appear. If not, wait until numbers appear in the box or boxes and once data is in place you should be able to tap the V below the box or boxes and the remainder of the boxes will appear. Once you get #’s/#’s in the (GPS/satellite box) tap and hold your finger on the blue circle (Where am I button). ​If you get Position not yet known wait until the app finds more satellites. Or, you may need a better view of the sky away from buildings and tree canopy. Wait until a black box appears (image left) showing your location. Then tap Add to Favorites. In the name box type “Home” and in the category box type a folder name, otherwise it will default to Favorites. I typed “Canada” for the Category. When you are done, tap Add. If you can't see the Add button, tap the back button on the tablet to remove the keyboard or hold the tablet in portrait orientation so you can see the Add button. In the future when you wish to add more way-points you can organize them by categories. The only way categories can be added is by typing them when adding way-points. Once a category has been created more way-points can be stored in that category. Tip: Using Tom’s port guides, find landmarks on Tom’s maps while a similar map is open in OsmAnd. Compare and establish the exact location and hold your finger in this location using the same process you did for your home save this new way-point. I still print Tom’s maps and carry them while in port. Go to the split screen and tap POI (Points of Interest) This will take you to choices. 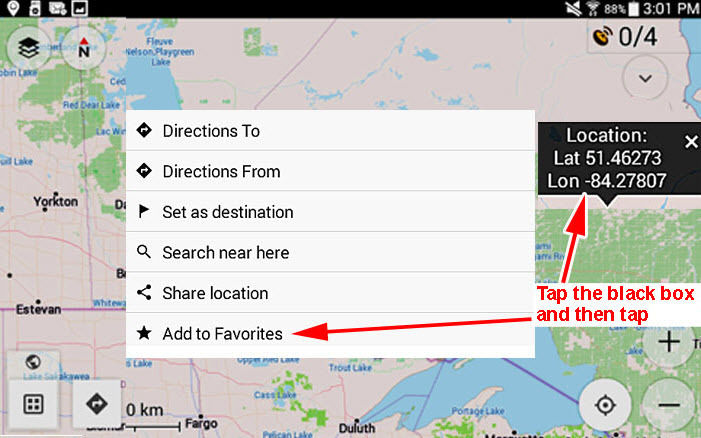 Tap on one such as add to favorites or show on map, etc. Your favorite way-points can be seen within the split screen. Tap Show All beside My Favorites. This is where you can delete, edit favorites by tapping a favorite and see your choices. To help organize favorites, you can edit the favorite and rename the category. If the category name exists, you will add to it. It it doesn’t exist, it will be created. I create individual port categories to be organized for my shore excursions. To remove categories and/or way-points tap on the trash can in the top right corner of the screen and boxes will appear beside the categories and way-points. Check the categories/way-points (tap the box beside) then tap the trash can again to delete. In closing, I would like to point out that I am not associated with any company, product or service. My goal is to describe the products and technology I use to make travel more enjoyable. David Elgie B.A. B. Ed. Cell phones are widely used for location and route planning maps when connected to both a cell and WiFi service. Under these conditions, the map is in the “cloud” and accessible via WiFi. 1) The phone must have a built-in GPS chip/antenna. Look for “GLONASS” which means the device connects to the Russian GPS satellites. There are some iPhones that connect both to the Russian and US satellites. 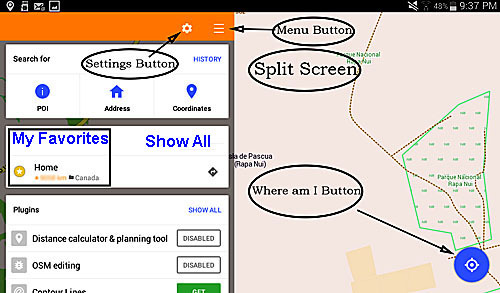 provide GPS location when you are NOT connected to cell and/or WiFi service. 2) The phone must have a map App and maps stored on the phone memory. There are several websites where you can download the Apps and FREE maps for cell phones. Cell phones have two limitations as GPS mapping devices, but these issues are not deal breakers. 1) Phones have small storage capacity vs. the very large internal memory plus micro-SD cards in tablets that provide almost unlimited maps. With a cell phone, you have to download maps for your first destination, then find a WiFi hot spot to download maps for your second destination, etc. as you travel around the world. With a tablet, you can download all the maps for the countries and cities you will visit and save them to internal memory and/or micro-SD cards so that you always have all the maps you could want or need for your travels. 2) Battery life seems to be more of a problem with a cell phone than a tablet. This may be due to the fact that cell phone users tend to leave the phone on most of the time. GPS mapping consumes battery power. Set the phone to “airplane” to turn off WiFi, cell service, and Bluetooth to conserve battery life. Turn the phone off when you do not need to look at a map. Experiment with your phone at home to see what the battery life is. Consider buying a portable battery to re-charge your smart phone. Check websites such as Amazon for re-charging units. as the GPS device for backpacking and how to get 10-12 hour battery life. There are several different types of maps and Apps for cell phones. These are the links to download the maps that I use. I install the “Here Maps” App to download FREE maps to my cell phone. This makes it easy to find my way while traveling. If you want to download a lot of maps, you'll probably run out of storage space on your phone. The good thing is that you can choose what regions you want to download.